This dish is one of our household staples. 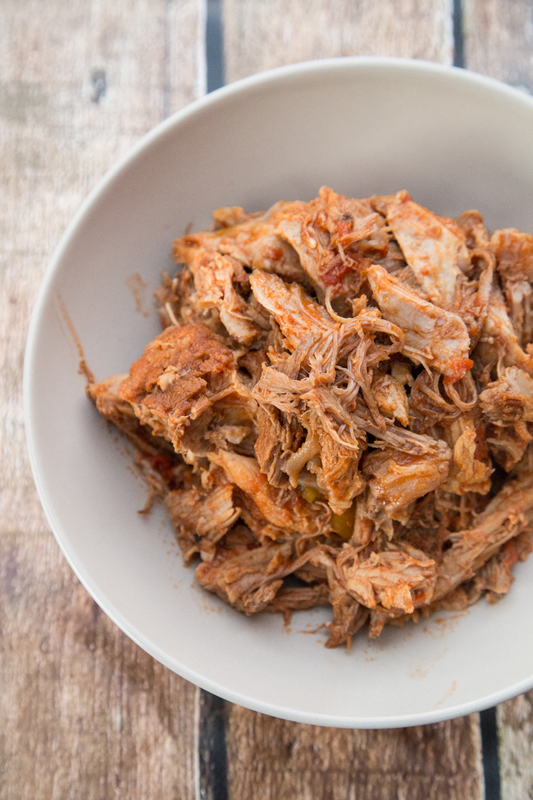 I love making a huge batch on a Sunday evening, and then we have delicious pulled pork for breakfast, lunch or dinner! Our favourite way to eat it is with some homemade guacamole with lots of fresh lime juice. 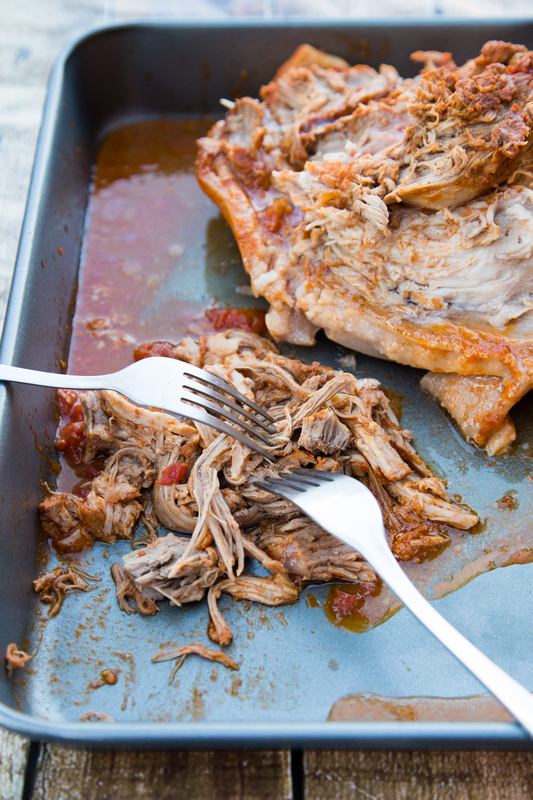 Pulled pork is basically a tough cut of pork cooked until it’s so tender you can “pull” it apart with two forks. It’s typically served with a bbq sauce but this version is cooked in a tomato sauce with only a few ingredients. The meat rub for this pork is smokey, a little bit spicy and very delicious! The cut that I use for this recipe is a boneless rolled pork shoulder. I leave the rind on, it definitely makes a difference to the taste and tenderness. I have removed the rind to make a slab of cracking in the oven (which was AWESOME) but after trying both, I prefer to leave it on. When it comes to cooking the pork, I use my pressure cooker so it only takes an hour. You can also cook it in a slow cooker, or in the oven for at least 6 – 8 hours. To make the spice rub, mix together the paprika, coriander, mustard, cayenne and salt in a small bowl. Un-roll the pork shoulder generously rub the spice blend all over the flesh-side of the pork (it’s not needed on the rind). Brown in a pan and then add to your pressure cooker/slow cooker bowl with the diced tomatoes, tomato paste and dijon mustard. Cook for 1 – 2 hours in a pressure cooker, or on low for 6 – 8 hours in a slow cooker (or in a 160C oven). After cooking it will be nice and tender; take it out into a tray and pull the meat apart with two forks, discard the rind. You will be left with quite a bit of tomato sauce, what I like to do is put the pork back in half the sauce. With the other half, I like to keep it in a container and use it for things like baked eggs, or quick tomato sauces with zucchini and carrot noodles. Can be used as sandwiches stuffing..